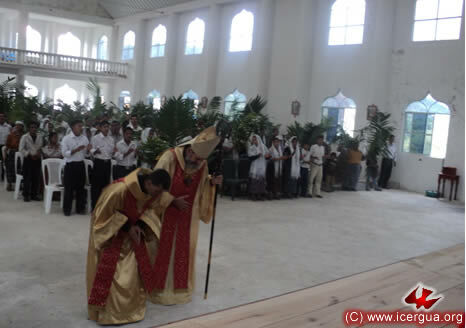 The bishop began the celebration of the Holy Week liturgy in the Epifanía del Señor Parish, Nucá, Santa Cruz Barillas, with the procession of palms and then Eucharist. A little away from the road, the People of God had prepared a place for the blessing of the palms. Several hundred parishioners followed the road, remembering the triumphal entry of Jesus into Jerusalem. The procession was led by a solemn group of acolytes. During the homily the bishop explained that the praise desired by the Lord is that of true conversion and a life totally open to serving God and loving one’s fellow human beings. In view of the fact that most of the older parishioners cannot understand Spanish, following the homily a translator repeated it in the K’anob’al language. 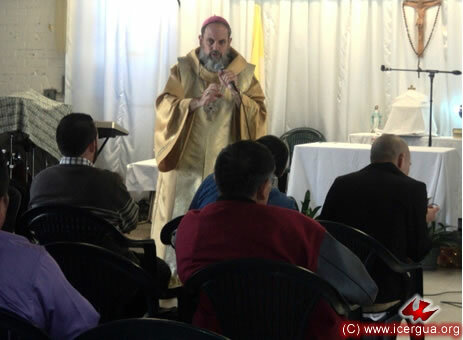 On Palm Sunday afternoon, the bishop went to the seat of the Glorificación de Santa María Parish in the center of Santa Cruz Barillas to preside at the Eucharist. 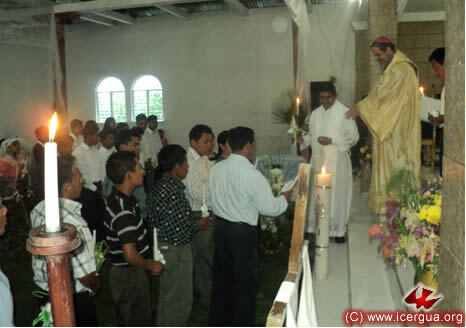 Father José Hernández, who with Father Hugo Patzán works as pastor in the parish, concelebrated with the bishop. Earlier the Father had presided at the blessing of palms and the procession to the parish church’s door. 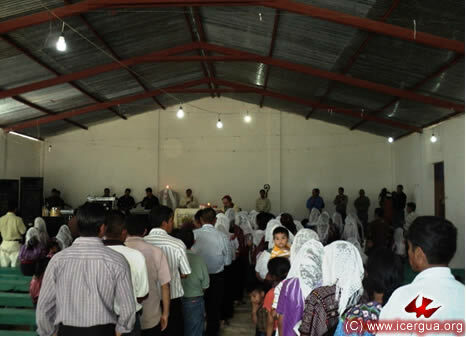 More than 1500 People of God participated in the Eucharist. All were filled with enthusiasm and eagerness to commemorate the mysteries of the passion, death, and resurrection of the Lord. 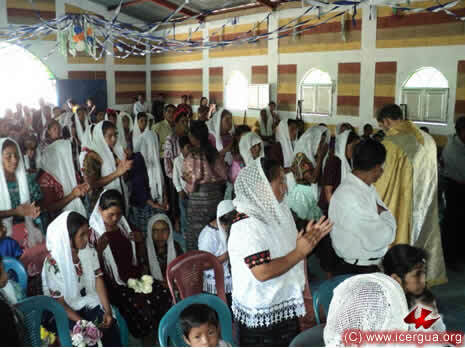 During the celebration, a goodly number of the worshipers, carefully instructed, received confirmation and missionary commission in a profoundly meaningful ceremony. Also the installation of two communion ministers was celebrated. 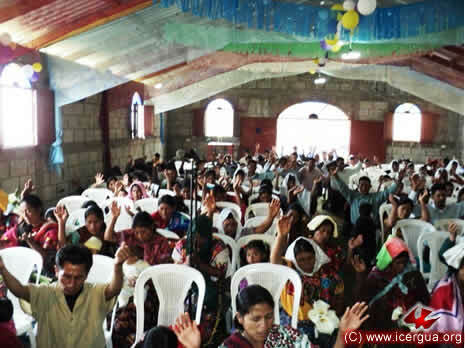 They will serve a new community that has been formed in Ixcán de Barillas. Left: The new minsters with some of the local ministers presenting the offerings. 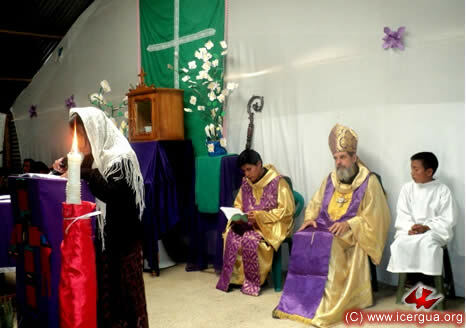 On Monday morning, April 2, the deanery of North Huehuetenango was celebrated in the parish see of Santa Cruz Barillas. A great number of the faithful from the various communities attended. 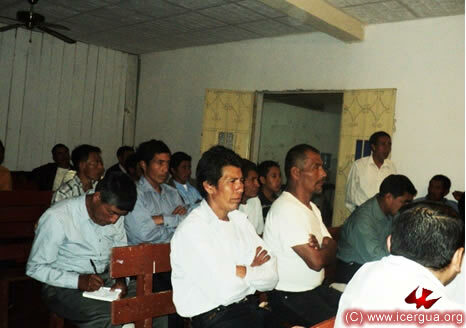 Particularly notable was the strong participation of people from San Mateo Ixtatán. During the deanery they presented the formal request to be established as a Renewed Catholic Parish. 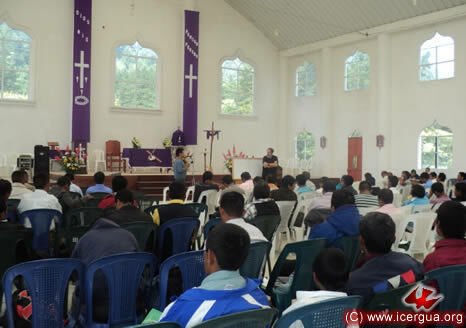 After the leaders of the various sectors into which the parishes are organized had reported, the parishes made brief reports, and then the three presbyters who work in the area reported. 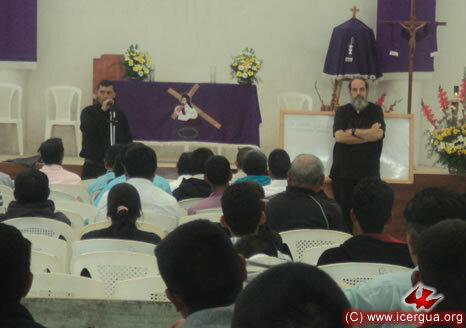 The presbyters’ presentations began with that of Father José Armando Hernández. The last presentation was that of Father Marcos Caicedo, pastor of the Epifanía Parish and, in the future, also that of San Mateo. Father Marcos laid out the process that was followed in San Mateo leading up to the request to be established as a parish. In response to the request and to the explanation offered, the date for establishing the parish was set for August 4. 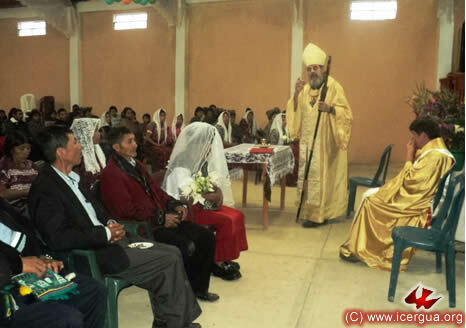 On Monday afternoon, April 2, the bishop visited the Victoria Amelco Community. The communion minister there had organized, for the first time, a group of readers and acolytes who will continue to assist in the celebrations. Right: The bishop with the minister, the readers, and the acolytes. 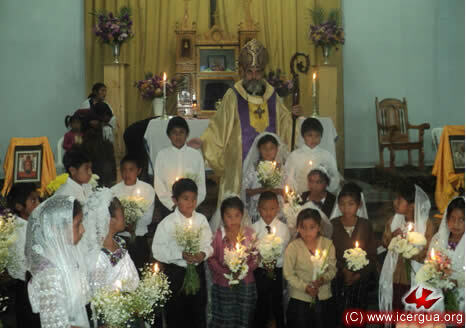 During the celebration several children received Christian Initiation. This began with the celebration of Baptism; Chrismation and finally Communion followed, as can be seen in the photograph at left. Also on this visit, six children made their first confession and Solemn Communion. 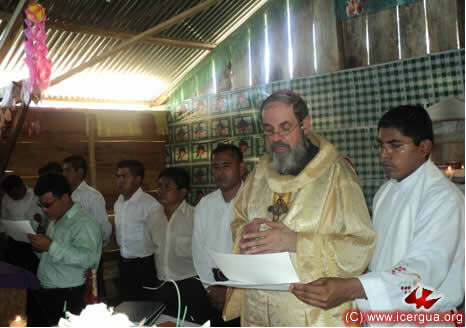 On Tuesday morning, April 3, the bishop came to the Nueva Jerusalén Community in San Mateo Ixtatán. 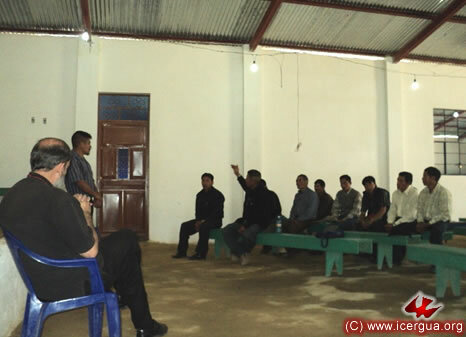 This community, originally a charismatic community which then became Protestant, converted last year in order to join our Church. They continue to meet in the same building in which they met before. 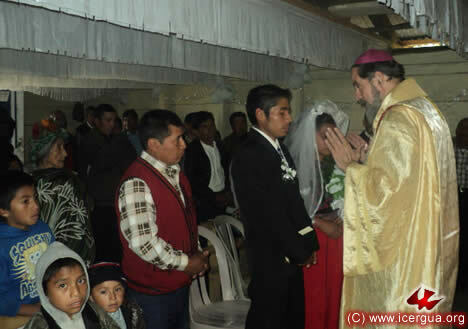 On the bishop’s visit, three couples received the sacrament of Marriage. 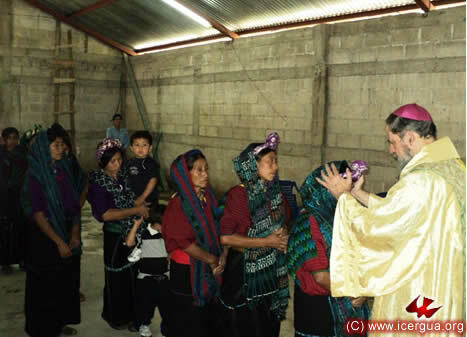 One of the people involved, having suffered for many years of suffering and having gone through the juridical-pastoral process of discernment, was able finally to regularize her situation. It was evident that each of the couples felt joy and a deep commitment on being able to give sacramental stability to their marriage. 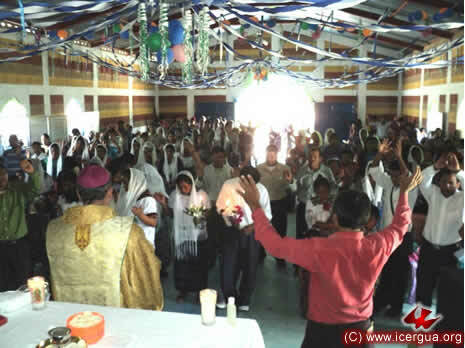 The celebration, which began with the administration of Reconciliation, involved the participation of a huge number of parishioners in the Communion. 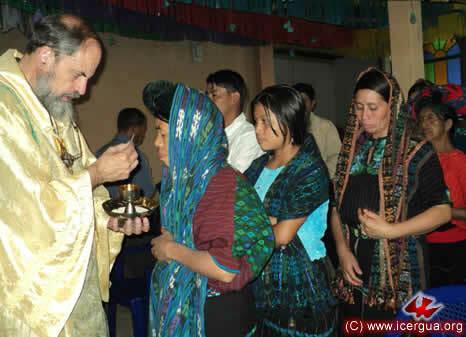 Left: The brother who leads the community coming to receive Communion. 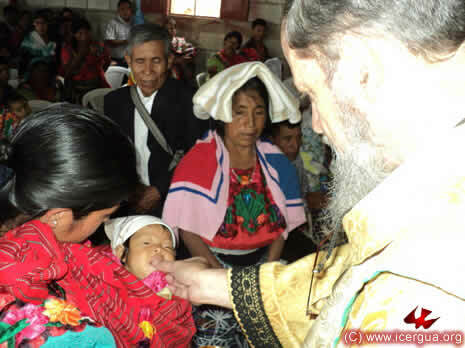 On Tuesday afternoon, April 3, the bishop came to San Rafael La Independencia to preside at the Eucharistic celebration with the Jolomcú Community. This community has experienced considerable growth. 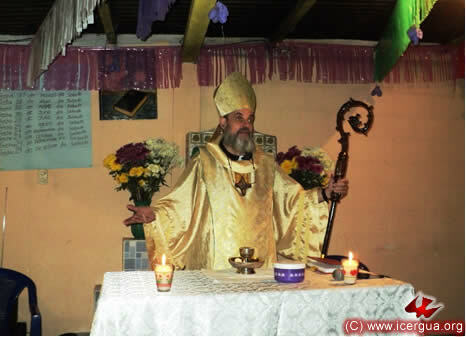 According to church records, Father Luís Felipe Corimanya has an average of about 500 hundred worshipers at the Sunday Masses. In preparation for Easter, the celebration began with the sacrament of Reconciliation to each of those who felt called to make a confession of sins and to receive absolution. in the San Miguelito Church of Santa Eulalia. Representatives of the four parishes that comprise this deanery participated, as did the four presbyters who work in them. Each of the representatives of the parishes or pastoral centers made a presentation on the situation in his or her parish. From the reports it was clear that throughout this area there has been sustained growth. 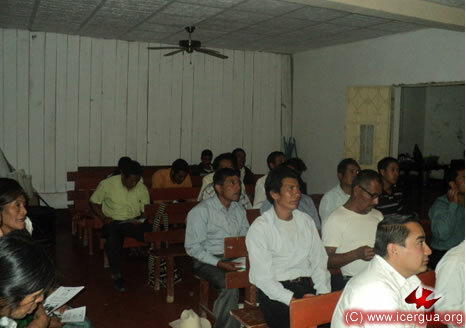 The presbyters who work in this area are Fredi Mux in Santa Eulalia, Felipe Corimanya in Los Santos Arcángeles, Bernabé Mateo in San José, and Orlando López in Guadalupe, Soloma. The presbyters also expressed their satisfaction about the way things are going in the several locations. At the end of the presentations, the bishop began the period of comment and instruction. The theme was the Church that Christ founded and some errors in thinking about its beginning. Instruction began with an exposition of the original meaning of the text of Matthew 16:18. 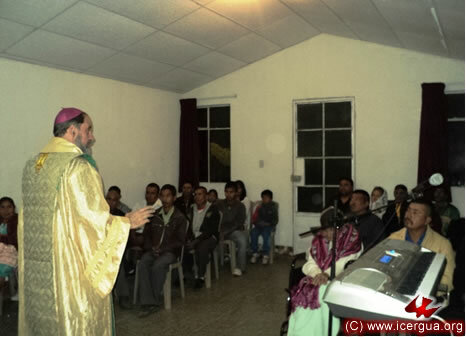 On the afternoon of April 4, the bishop met with the Parish Council of the Renewed Catholic Parish of Santa Eulalia. The reason for the meeting was to try to find a solution to some divergent opinions between one of the communities and the parish council. After a long dialogue, in which both parties explained their positions, a consensus was achieved, according to which the disagreement could be resolved in an open dialogue between the leaders of the community and the parish council, for the disagreements had not yet become deep or rigid. On Wednesday afternoon, April 4, the bishop presided at the celebration of the Eucharist with the Belén Community, Santa Eulalia. The faithful had prepared the visit with care. A beautiful carpet had been made, and a large group of children made their first Reconciliation and Solemn Communion. With the bishop, the local parish presbyter, Father Fredi Mux, and the presbyter of San José, Father Bernabé Mateo, concelebrated. Left: Absolution being administered for those who would be making their Solemn Communion. Communion was particularly fervent and moving. The children were aware of the transcendence of the sacrament and of how it implies that they must actively give witness to the living presence of Christ. At the end, the children asked the bishop to pose with them in order to make a record of such a special day. 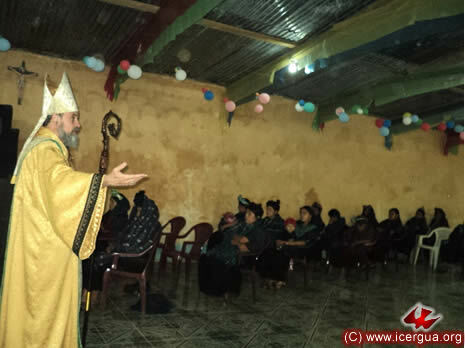 On Wednesday evening, April 4, the bishop came for the first time to the San Carlos Community of San Juan Ixcoy, Huehuetenango. It is a new community, consisting of a few families, but enthusiastic about working to form a stable community. 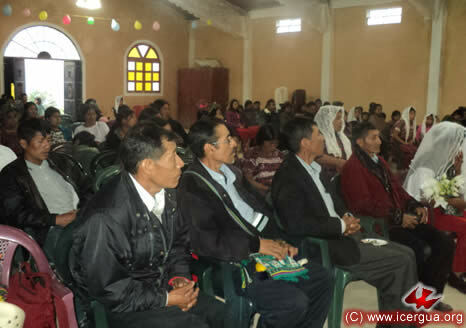 The faithful of the Soloma Community are responsible for accompanying the community and providing them with information. 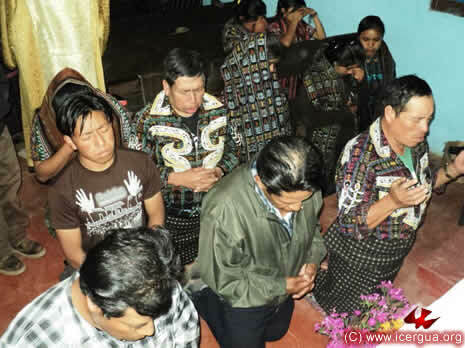 At the celebration came several worshipers from distant communities who are also eager to join the Church in response to the Lord’s call to them. During the homily the bishop lifted up the characteristics of the Church and how important it is that the great blessing be discovered and accepted that is implied in being chosen to live anew the Church that Christ founded. 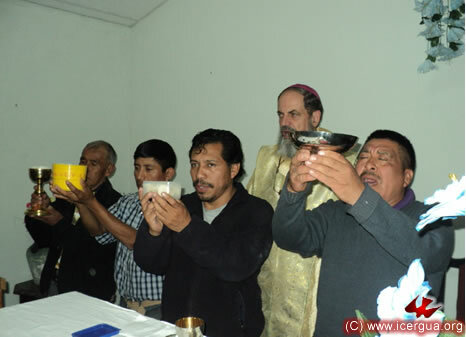 On Maundy Thursday, April 5, Monsignor Eduardo’s activities began in central Nebaj with the celebration of the deanery that includes the communities of Nebaj and San Juan Cotzal. 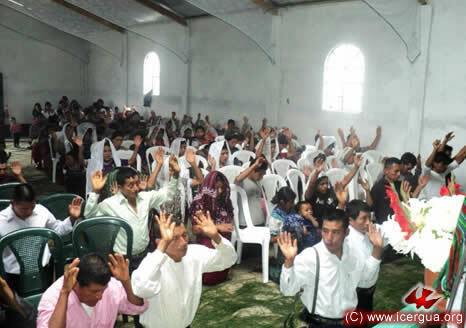 The participation of the faithful was numerous. All of them were committed to the work of organizing their communities and helping them to grow. 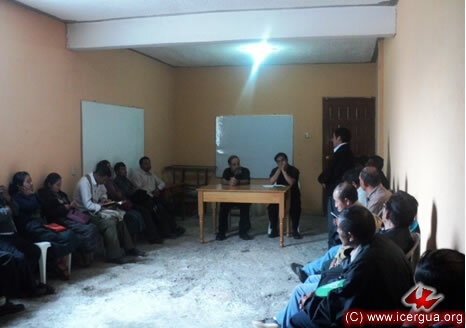 As per custom, the meeting began with reports from the communities made by their representatives. Right: Brother Cayetano, representative from the Salquilito Community, reporting on his community. The bishop continued his instruction on the mission that Jesus gave to the apostles. 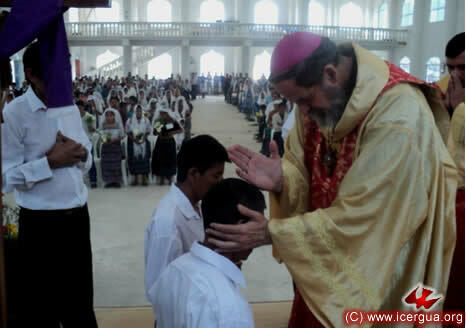 The bishop also presented brother Amílcar, who will work as a missionary in the area, trying to encourage the formation of new communities and the growth of existing ones. 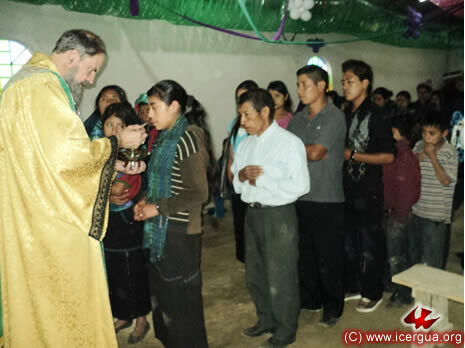 On Thursday afternoon, April 5, the bishop went to the Uchuch Community, Nebaj, for the celebration of Eucharist, within which a wedding was celebrated. The bishop’s homily dealt with the liturgical meaning of Maundy Thursday. In light of the Word of God, the bishop spoke to the wedding couple of the grace, through the sacrament they were about to receive, to be able to make their home a genuine presence of the Church, loving one another as Jesus loves the Church. The installation of a communion minister for serving the local community was also celebrated. 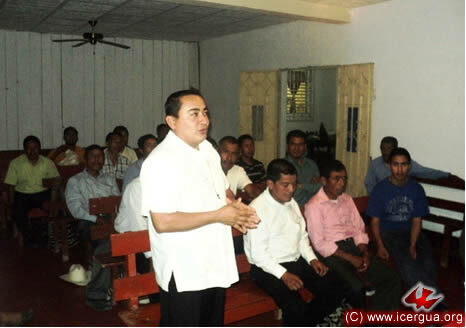 Father Marco Tulio, pastor for the Nebaj area, presented the candidate for the ministry. 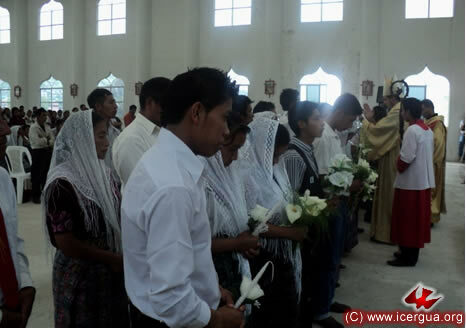 On Thursday afternoon, the bishop presided at the Eucharistic celebration with the Salquilito Community in central Nebaj. During the homily on the reading of the Gospel of John about the washing of feet, the bishop pointed out that this symbol indicated the washing that Jesus does of our sins through his blood shed on the cross and insisted that keeping this command of the Lord means promising to take the Gospel to those who do not yet know it so that they may be purified with the same blood of Christ and be regenerated into a new life. During the celebration an elderly couple, who had lived together for many years, celebrated their wedding. In addition a sister was confirmed. In the context of the festival of the love of Christ, the bishop urged the husbands to renew their promise to love with a love that is like the love of Christ, which gave us life. 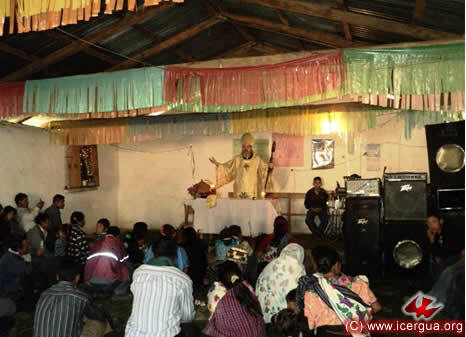 On Good Friday, April 6, the bishop began his pastoral activities in the Ilom Community in Chajul, where the Deanery of the pastoral centers of the Los Mártires de Chajul Parish was celebrated. Present were many of the faithful, who reported on the growth of their communities in the past few month. 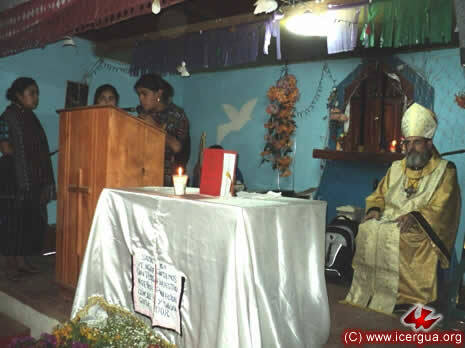 Sister Maribel, a representative from the Covadonga Community (right), informing the Deanery that three new families had joined the community. 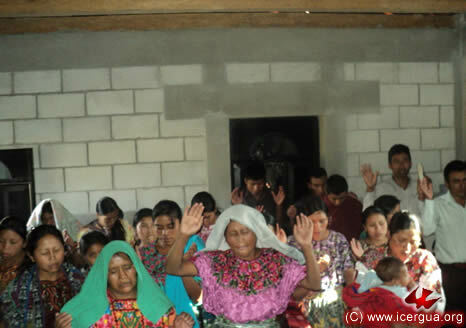 They do not have a church building, and the owner of the finca where they live is opposed to constructing one. 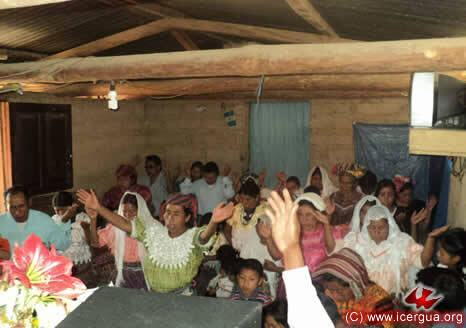 This has caused the faithful to look into the possibility of getting a space outside the finca so that the growing community may be able to gather together. 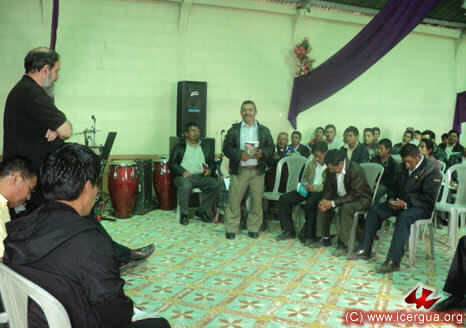 The brother who represented Sajsibán, where the bishop was to go in the afternoon for the blessing of its church, shared the experience of having built the church using only local resources, not having the help either of the central Church or of any other institution. 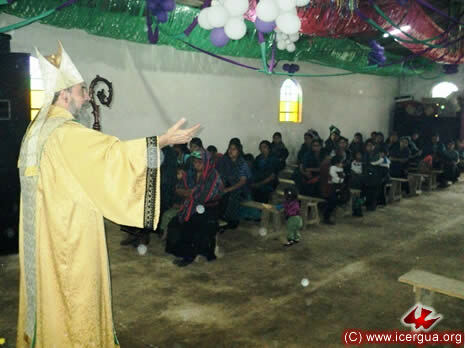 On Friday afternoon, the bishop came to the Sajsibán Community. 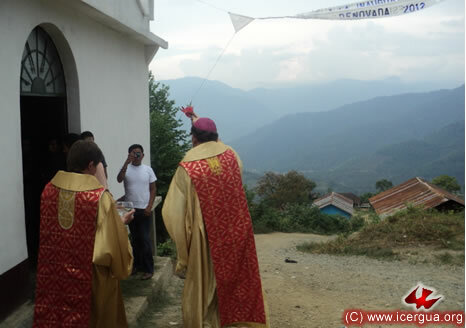 Although it is part of Nebaj geographically, it is part of the Chajul Parish. 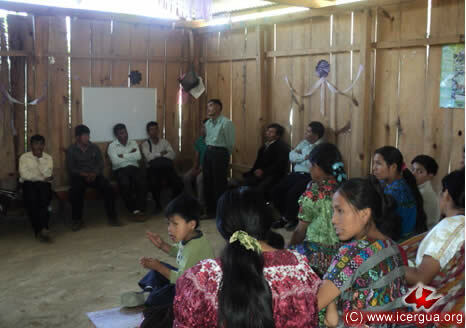 Access to the community, which is located on the top of a steep mountain, is by a dirt road. The faithful, who joined our Church only two years ago, have built a spacious and well-appointed church in a most beautiful setting. The celebration began with the administration of the sacrament of Reconciliation. 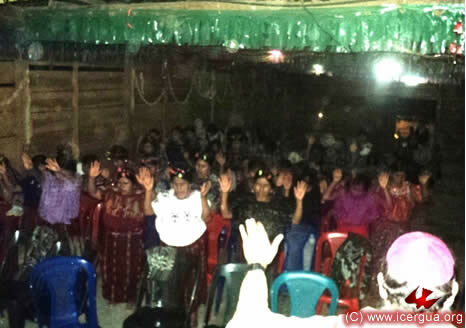 The church was full of worshipers in spite of the fact that the representatives of neighboring communities did not arrive until the vigil began later on. The homily, based on the readings for the day, specifically the Passion according to St. John, dwelt on the sacramental dimension of the Church and the fundamental role that recognizing the Virgin Mary should play in the Church in accord with the explicit wish of Christ. After the homily, there was the blessing of the church. Left: The bishop sprinkling the exterior of the church after blessing the inside. 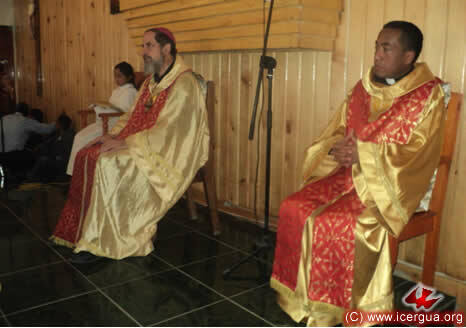 The bishop was accompanied by Father Marco Tulio Calderón, pastor of the parish. 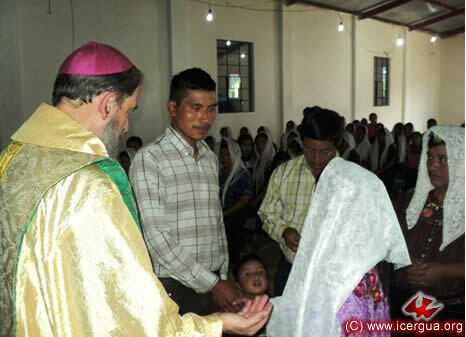 During the presentation of gifts, seminarians José Alfredo Hernández, who was accompanying the bishop, and Robinson Cumes, who does pastoral work in the area, also participated. 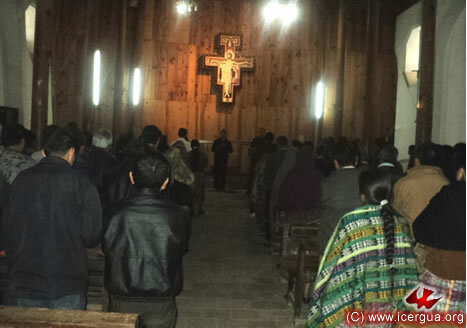 On Good Friday, the bishop presided at the celebration commemorating the thirtieth anniversary of the martyrdom of the Blessed Martyrs of Chel, Chajul, with the faithful in the Chel Community. 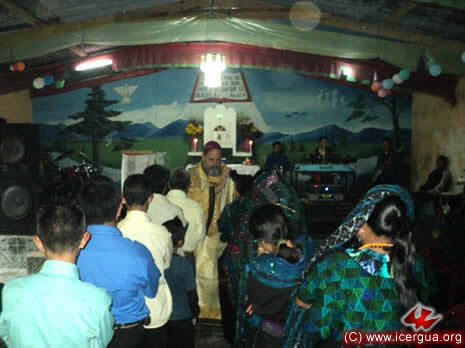 The celebration was highly charged emotionally, for the faithful recognized in these faithful martyrs the seeds of the present community, as well as the missionary dynamism that fills the faithful here. The bishop made a connection with the blood shed by Christ and the blood that, by Christ’s will and along with His, was shed by the eighty-five martyred in Chel. 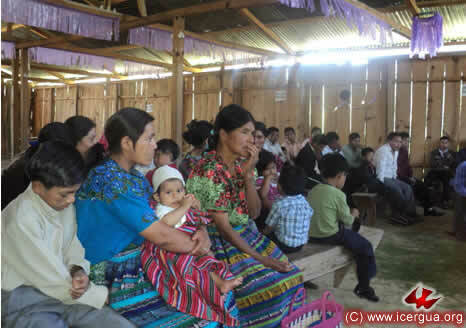 A little before the celebration, the faithful of the community had shared with the bishop the joyful news that seven families are going through the catechetical process in order to become members of the Church. 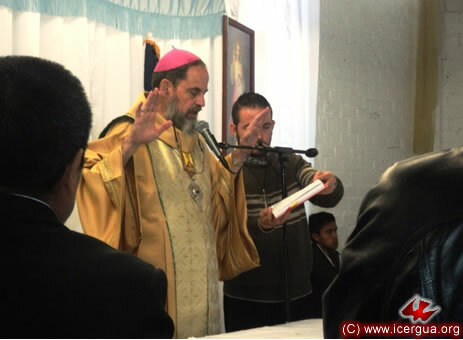 On Saturday morning, April 7, the deanery of Cunén and Sacapulas was celebrated in Cunén, El Quiché. The meeting was very well attended. The faithful shared the successes they have enjoyed. Right: The brother representing the Trigales Community reporting that ten families have entered the church during the last year. The other communities, although their growth was not as strong, have also been growing steadily, and, most importantly, are committed to solidifying their organization. 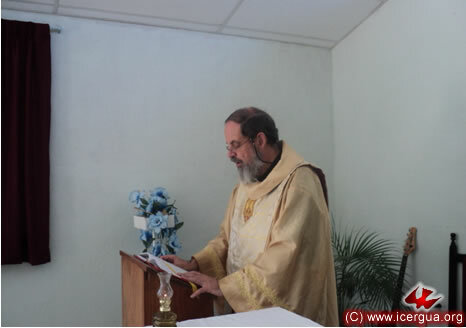 Father Bernabé Mateo, who is responsible for pastoral care in this area also, reported on the situation of the past year, indicating, along with strengths, some of the communities’ weaknesses. 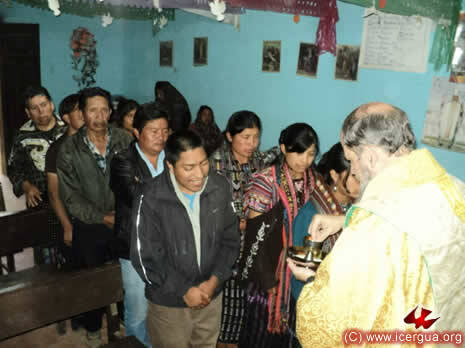 During the instruction period, the bishop urged the faithful to promise unconditionally to make present every aspect of the Church that was born on Pentecost. The faithful responded with their eagerness to renew this commitment. 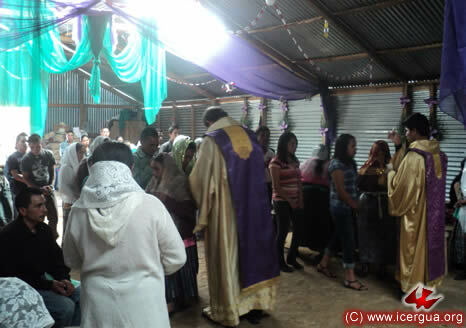 On Saturday afternoon, the bishop celebrated the First Resurrection Eucharist with the San José-Laguna Seca Community of Cunén. 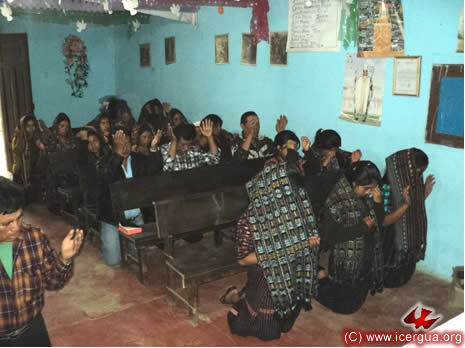 It is not a large community, but it is enthusiastic and eager to commit itself to evangelism and to build a church so they can carry out all the activities of their community life. 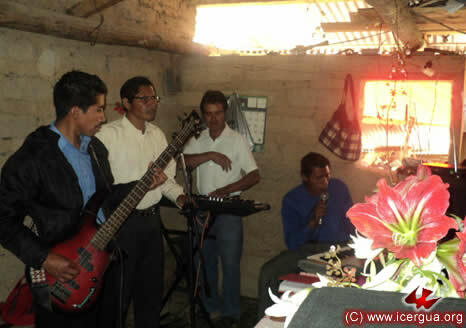 The musical accompaniment of the liturgy was provided by people from the Santa Clara Community. 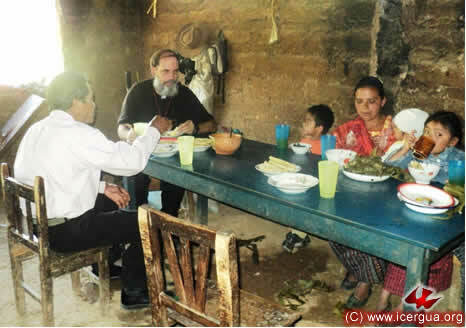 After the celebration, the bishop shared a simple but deeply affectionate meal with the family where the small house of prayer is located. 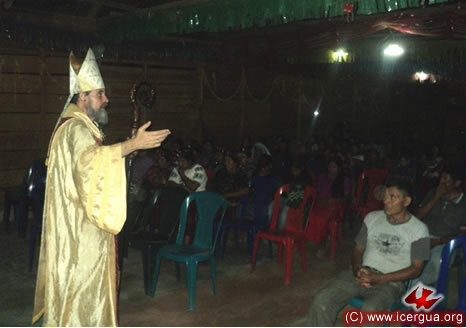 At the end of the afternoon on Saturday, the bishop went for the first time to the Chuatzeté Community in Sacapulas. It is a recently formed community with just a few families, but enthusiastic about getting organized as an authentic Renewed Catholic Community. The Easter Celebration was solemn. 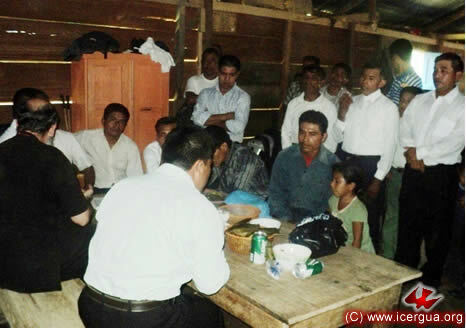 It included the administration of Christian Initiation to a child, the son of one of the families who are members of the Community. As is the practice in the Church, the Christian Initiation culminated with the administration of Holy Communion to the neophyte. 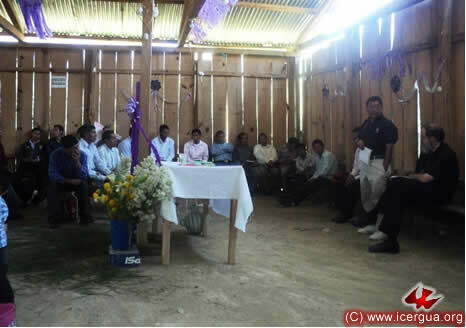 On Easter Sunday, April 8, the bishop celebrated the Eucharist with the personnel of the Education Center in Huehuetenango. 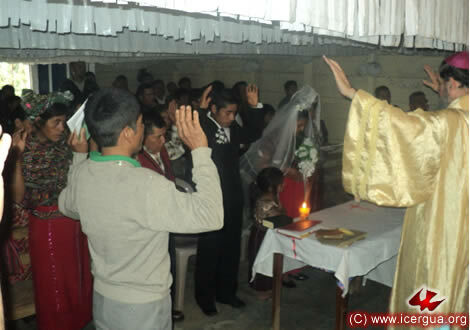 The worshipers participated with great devotion and gratitude, especially brother Carlos Muj’s parents, who, because of age and poor health, are unable to attend the Holy Mass in a church. 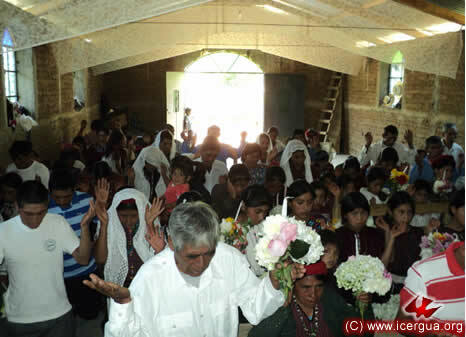 On Easter Sunday afternoon, a very beautiful Eucharist was celebrated in the Santísima Trinidad Parish in Uspantán, El Quiché. 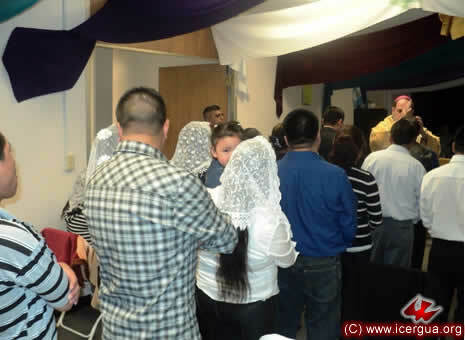 All the faithful had been carefully prepared by the parish pastor, Father Denis Obando. After the ceremony, as a gesture of their commitment, they all signed a document promising to carry forward the apostles’ missionary action. The celebration was attended by many, many faithful, representing many different communities. During the celebration several new families who have joined the Church were welcomed, and it was announced that an entire community of twenty-two families had decided to convert and join the Church. The joining will take place when the process of preparation has been completed. All of the faithful who was confirmed through Holy Unction showed their eagerness to live like the apostles and continue their work. After the Communion, all the confirmands came to the Paschal candle, which had been blessed during the Paschal vigil, to light the candles that symbolize their missionary commission. At the end of the celebration, the swearing in of the new Parish Council took place. Its members serve a two-year term in office. All the members of the new council also lit a candle from the Easter candle to symbolize that the ministry that they have received will be carried out as a witness that Christ has risen and as a promise to carry the Gospel to everyone everywhere. 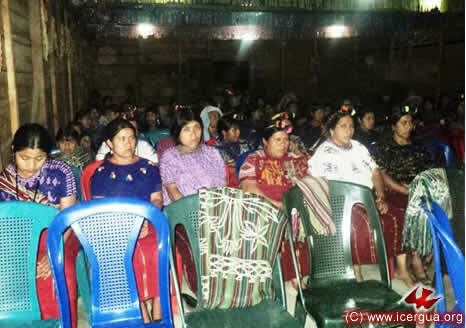 In the evening of April 8, the Deanery of Uspantán, la Zona Reyna and Chamá Grande was celebrated. 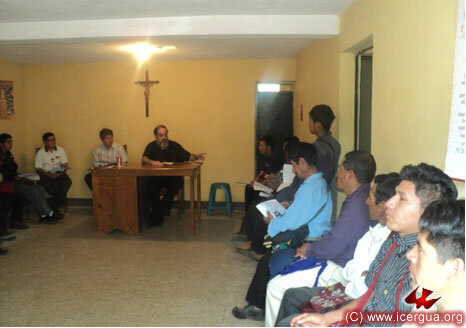 The community representatives as well as Father Denis and José Manuel Castro, the seminarian who does pastoral work in the Parish, made reports on how the pastoral work is progressing. On balance the reports were very positive and it could be noted that after the severe crisis that struck the parish two years ago, most of the problems have now been overcome and growth is taking place again. During the instruction period the bishop continued to explain the meaning of various biblical texts that refer to the distinctive nature of the Church. 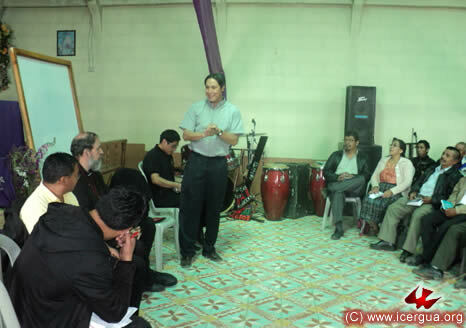 At the end of the meeting all the participants renewed their commitment to solidify the church’s organization and help the communities to grow. 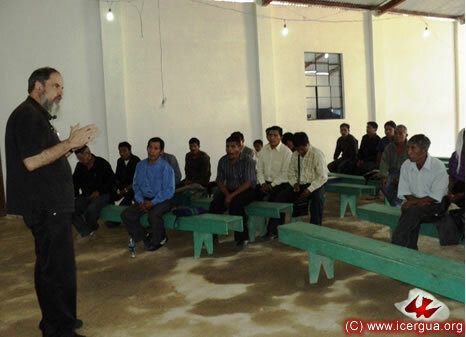 They also promised to work in establishing new communities through missionary outreach. 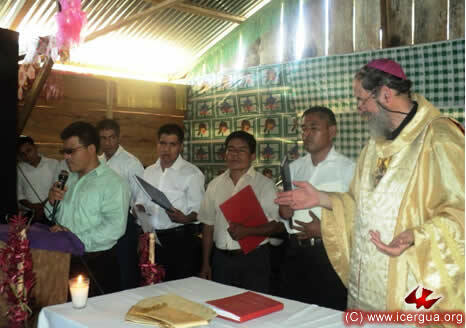 On Monday morning, April 9, the bishop, accompanied by Father Denis Obando and seminarian José Alfredo Hernández, traveled to the banks of the Chixoy river in La Zona Reyna to go to the Chamá Grande Community, Cobán, Alta Verapaz, where a new parish is to be established. 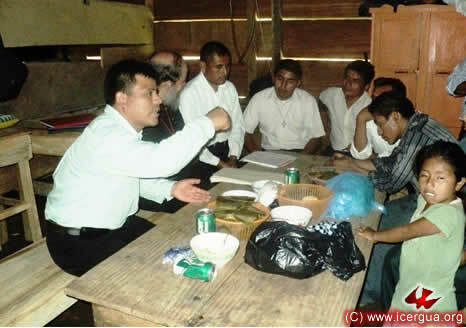 As soon as they arrived at Chamá Grande, the bishop met with the future pastoral council to explain to them all the implications of being established as a parish, both in their relation to the Church and to the records that have to be kept in order to guarantee stability and to provide effective service to the parishioners. 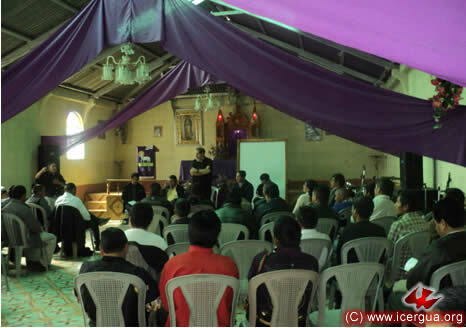 The bishop indicated that as a parish they assume the commitment to organize all the services of instruction, administration of sacraments, and of missions that the Church has to have. In addition, they must avoid every kind of questionable actions that can confuse the People of God. 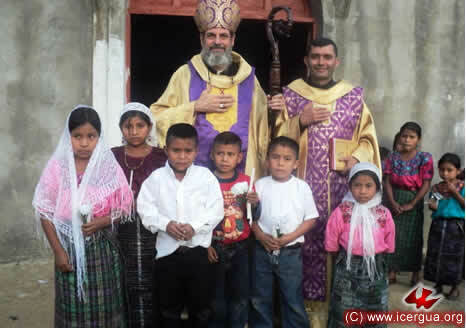 In view of the fact that several of the faithful do not fully understand what is said in Spanish, brother Baldomero de Cobán, who had originally organized the community, translated what the bishop had said. Then the faithful made the commitment to carry out all the bishop’s instructions, in order then to proceed to celebrate the Eucharist and the creation of the parish. 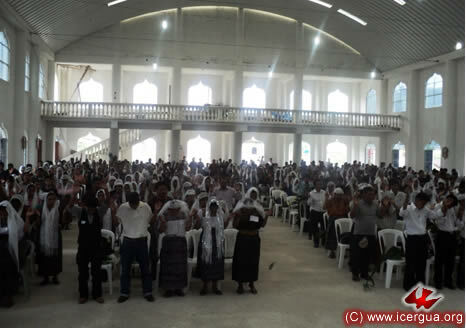 More than 1200 worshipers, coming from various communities that are to form the parish, had come to Chamá Grande for the Eucharistic celebration. Some of those present had had to travel four hours. The distances that Father Denis has to cover every month to visit the communities are enormous. 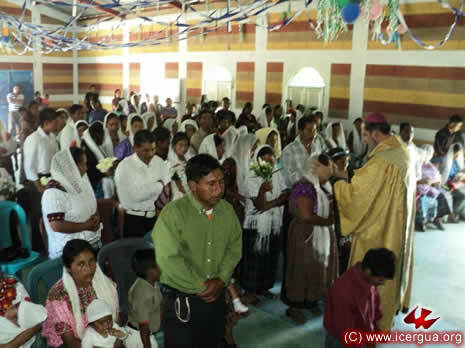 After the homily and after the Assembly had ratified the acceptance of the commitments that a parish makes, the bishop proceeded to read the decree creating the Renewed Catholic Parish “La Natividad del Señor,” whose see is in Chamá Grande, and which includes the communities of La Zona Reyna, located along the Chixoy River. 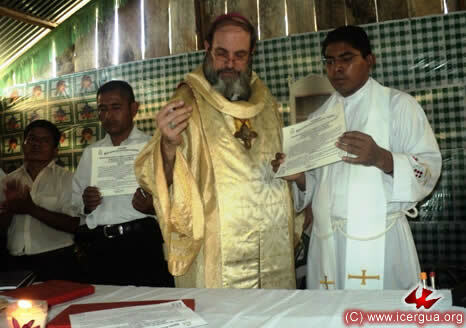 After reading the decree, the bishop delivered one copy of it to brother Antonio, president of the parish council, and another copy to Father Denis, the pastor of the new parish. Then the books of registration of Baptisms, Confirmations, and Marriages were delivered. Since these communities had been constituted as a Pastoral Center, it had been granted the provisional use of pages for registering the sacraments, which now must be incorporated into the definitive books that were made for the creation of the parish. 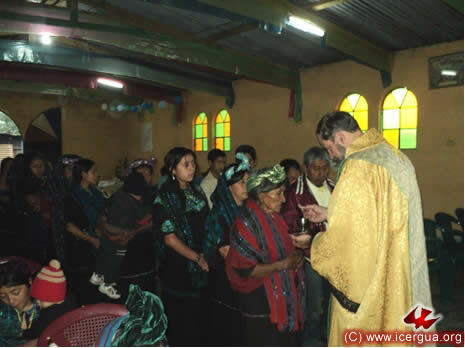 Then, communion ministers were installed so that the communities that do not yet have one can have the presence of the Most Holy Sacrament and participate in communion even when the presbyter is not there to celebrate Eucharist. 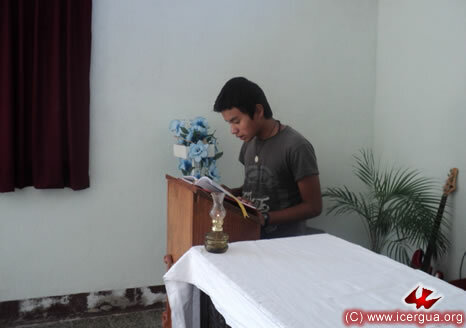 The new communion ministers presented the offerings that were then consecrated in the Eucharistic celebration. When the ceremonies of creating the parish were complete, the bishop ended the circuit that he began on the Thursday before Holy Week by celebrating the Chrismal Mass. 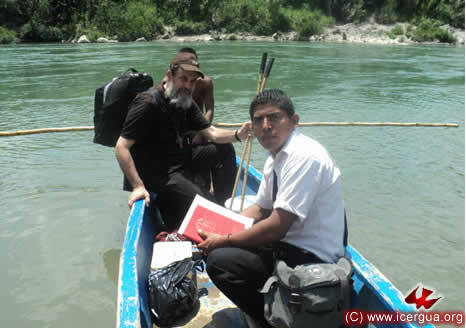 Left: The bishop with Father Denis Obando crossing the Chixoy River to the place where they had left their car. 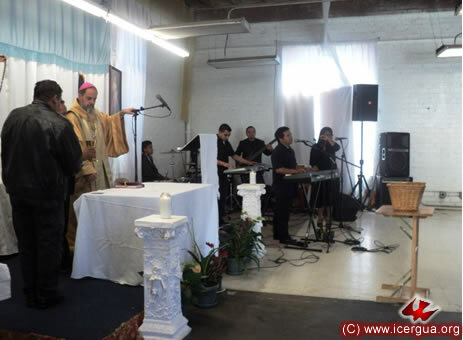 On Saturday afternoon, April 14, the bishop participated, as is now the custom, in the radio broadcast from Los Angeles via Radio Nueva Vida, Nucá. 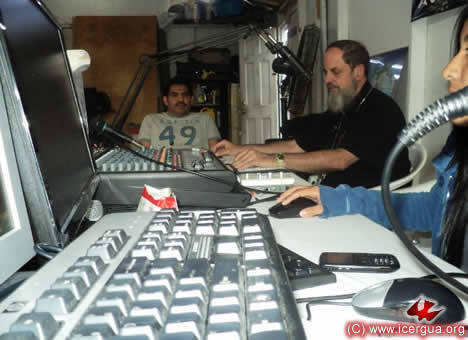 Left: Brother Ronaldo Velásquez, the program director, and sister Ana, the broadcast assistant, during the broadcast. The bishop’s theme was the meaning of Christ’s Resurrection today. In addition several question about how the Church is organized in Los Angeles were asked. With respect to the resurrection, Monsignor Eduardo explained that through the sacramental life we have an access to the Risen Christ that has the same reality and force today that it had for the Apostles. 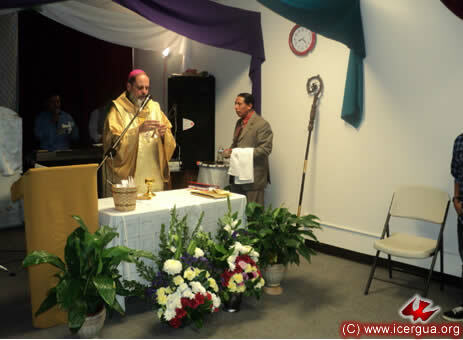 To answer the question about pastoral organization, the bishop described that of the Renewed Catholic Parish of San Miguel Arcángel, whose headquarters are at 2227 Jefferson Blvd., Los Angeles. 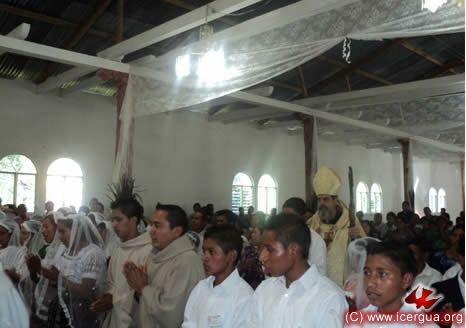 In the afternoon there was a very beautiful celebration in the see of the San Miguel Arcángel Parish. 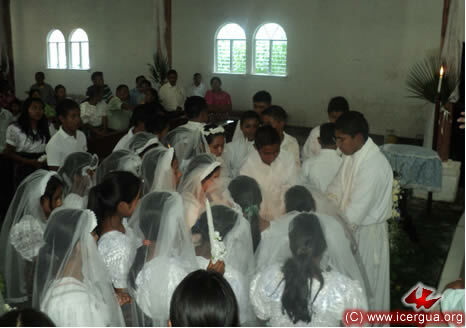 For the first time in a few years, Christian Initiation was celebrated, on this occasion for two children. Also two faithful were confirmed and two children did their Solemn Communion. 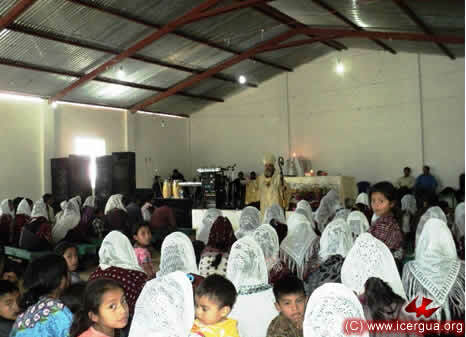 The celebration began with the administration of Reconciliation for a large number of worshipers, who were joyfully celebrating the Lord’s resurrection. 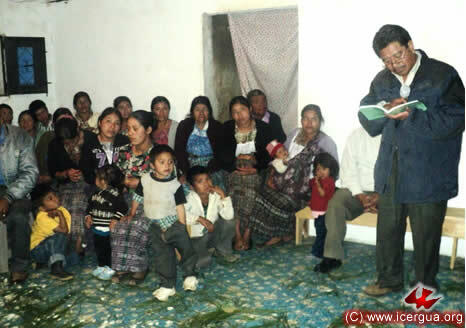 Bryan and Lydia Ana were the children initiated into Christian Life. The parents of Bryan are originally from Santa Cruz Barillas, and those of Lydia Ana are from Patalcal, San Mateo Ixtatán. 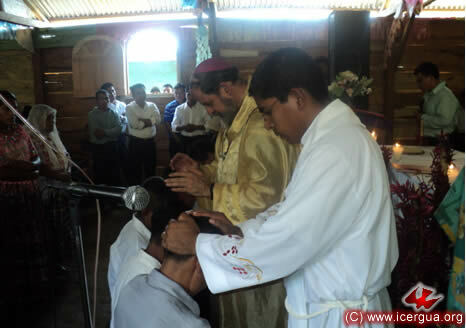 The Christian Initiation began with the administration of Baptism, then continued with Chrismation, and finally, as can be seen in the photograph at right, ended with Communion. 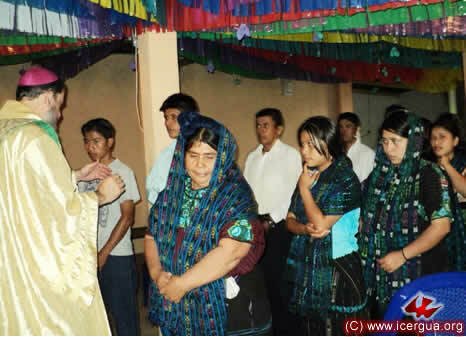 Austín and María were the children who made their first confession and Solemn Communion. Eugenio Tomás and Candelario were confirmed. Right: After Communion, both accepted the commitment to be missionaries like the apostles and they received the lit candle, symbol of the mission commission they have received. 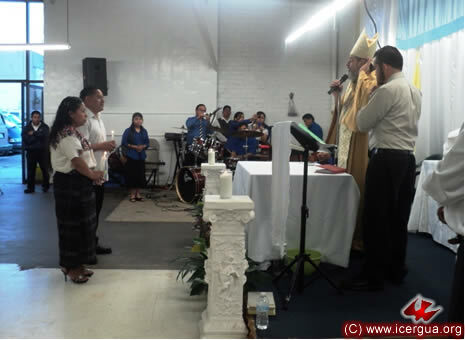 In the evening of April 14, the bishop visited the Restauración en el Espíritu Santo Community located on Third Street in Los Angeles. The faithful received the bishop with great happiness, and the celebration began with the administration of the sacrament of Reconciliation. During the homily the bishop stressed the present-day character of Christ’s resurrection, taking his point of departure from the reading in the First Letter of John, which speaks of the witness of water, blood, and the Holy Spirit. At the end of the celebration, the recently born sons of two families, members of the community, were blessed. 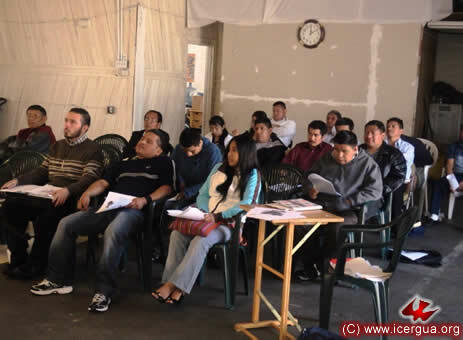 About twenty-eight faithful attended the first session of instruction in the Department of Theology and Ministerial Education for the People (DETYM) at the seat of the Los Angeles Parish. At the end of the first session the commitment was made to let the theoretical instruction serve to raise questions about the community’s organization. 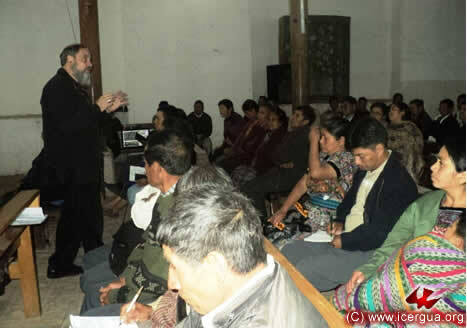 At the end of the instruction, the faithful asked the bishop a series of questions about the mechanisms whereby the parish may be better organized and could respond more effectively to the expectations and needs of the faithful. 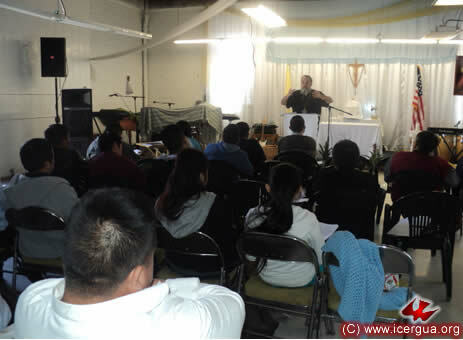 In the afternoon of April 15, Monsignor Eduardo presided at the Eucharistic celebration with the DETYM students. In light of the liturgical readings for the day, the bishop invited the worshipers to be open to experience the risen Christ in their own lives, especially through the sacramental life, such that they may make real and concrete the sense of being one, which the first Christians shared. 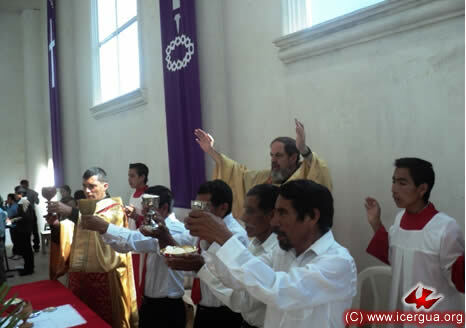 The celebration was accompanied by the music ministry of brother Ronaldo Velásquez, who actively commits himself to the strengthening of the Parish. 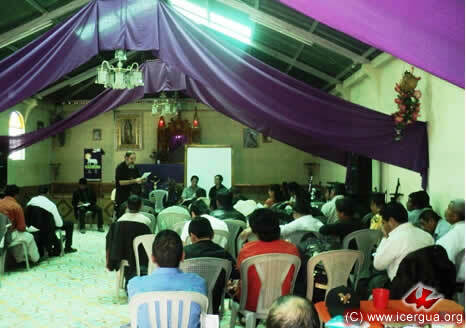 On Wednesday, April 18, Monsignor Eduardo went to Comalapa to have another session of instruction for the Great Mission, which will be carried out in this parish beginning on Pentecost Day. 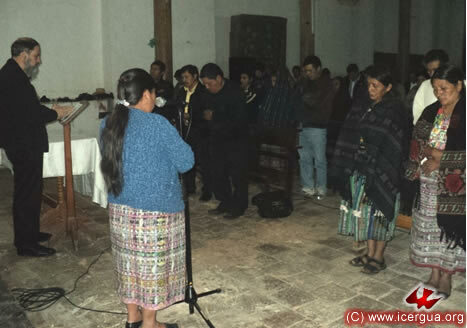 Father Francisco Simón, co-pastor of the Cathedral, led the opening prayer and translated into the K’akchiquel language the bishop’s leading ideas in order to assure that everyone would understand them correctly. The most elderly, who do not speak Spanish, were noticeably enthused on hearing the concepts explained in their own language. The purpose of the meeting was to respond to questions and clarify concerns regarding the themes of the third and fourth instruction periods. The instruction centered particularly on Matthew 16:18, explaining it from the patristic perspective in such a way that the faithful might have a firm grasp on the fundamental aspects of the Church that Christ founded and might be able then to witness to it. The enthusiasm and sense of expectation were tremendous. At the end of the session, there were nine more missionaries who joined the effort, bringing the total now to 124. The routes that the mission teams will follow were set. The next activity will be a retreat and mission commissioning, which will take place on Saturday, May 26. 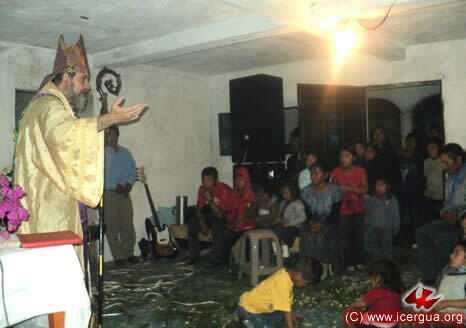 On May 25, the bishop will have a meeting with the Communities of the Renovación Carismática in the parish and on Pentecost Day, May 27, he will preside at a Youth Assembly, also in Comalapa. The chief objective will be that all the parish’s strengths and forces will be actively involved in the program of missionary outreach. 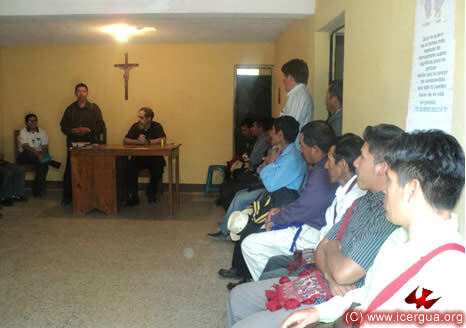 On Friday afternoon, April 20, Monsignor visited the Chiuitzanchaj Community. 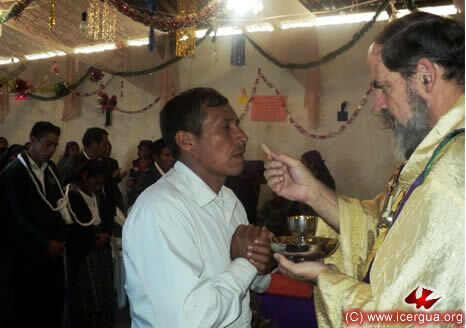 The previous weekend they had celebrated their anniversary, but the bishop could not be there to celebrate the Eucharist, and so Father Juan Moisés represented him. 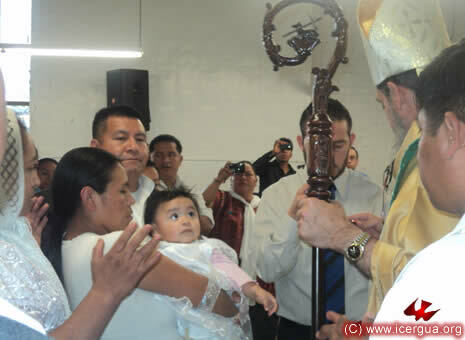 On this visit, the bishop saw the fervor and enthusiasm of the faithful. During the homily the bishop emphasized the present-day reality of Christ’s resurrection, and invited the faithful to be open to Christ’s presence, particularly during the breaking of the bread. The celebration began with the sacrament of Reconciliation. That allowed the great majority of worshipers to receive the Holy Communion. 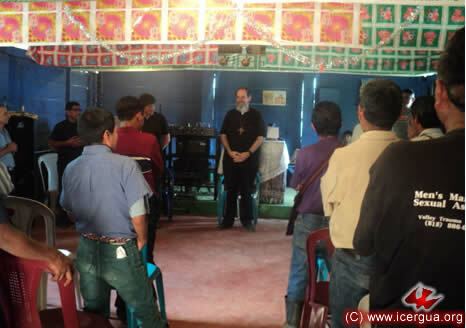 In late afternoon of April 20, the bishop went to the Pajomel Community in Santa Cruz La Laguna, Sololá, for his monthly visit. It began with the sacrament of Reconciliation. The bishop’s theme in the homily was that Eastertide is when we must prepare ourselves for the mission of proclaiming the Risen Lord. In the light of the Gospel, he told them of the urgency of being prepared to witness to the Lord. The participation in Holy Communion was strong. 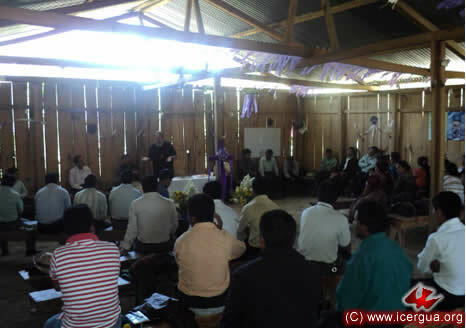 The worshipers promised to think about the most appropriate ways to carry out the evangelizing mission. On Saturday morning, April 21. 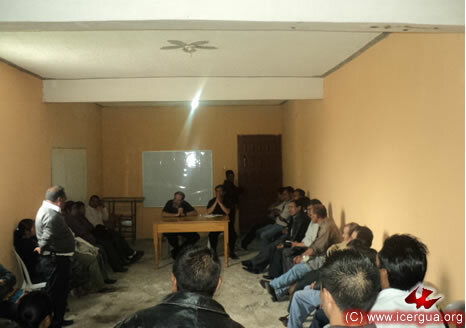 Monsignor Eduardo came to the village of Xenaxicul to begin his work of instructing the community’s leaders. They had all come out to welcome the bishop and accompany him from the place where he left his car to the church, where the instruction would begin. 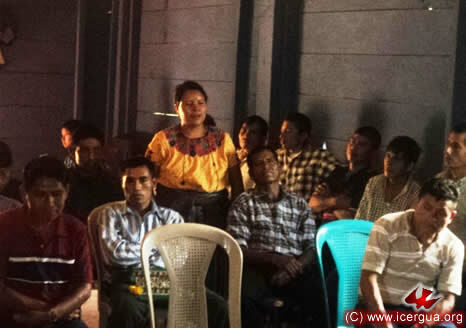 Although the original idea had been to offer instruction only to the servers and leaders of Xenaxicul and Cancela, which are two stably organized communities in Aguacatán, the leaders of the Paraxtut and Puente Chuatuj de Sacapulas, Quiché, were also there. The theme was “The Catholic Church that Christ founded when he sent the Holy Spirit on Pentecost.” The faithful seemed very happy with the instruction, for it explained the original meaning of the texts that set forth the foundation of the Church. 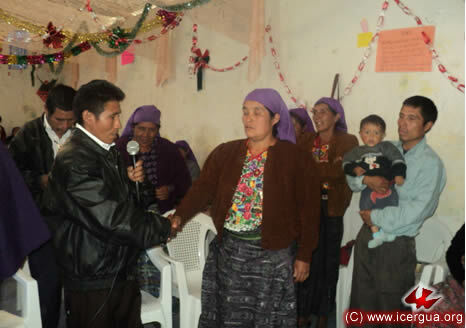 After the instruction, the celebration of the Anniversary of the Xenaxicul community began. 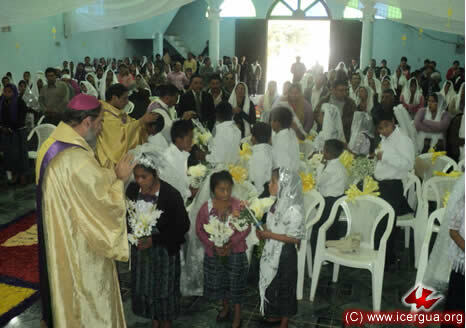 For the occasion, Christian Life was initiated for eight children, two marriages were celebrated, and a large group of children hade their Solemn Communion. The ceremony of Baptism was especially significant, because the worshipers had been carefully instructed about the meaning and scope of baptism. 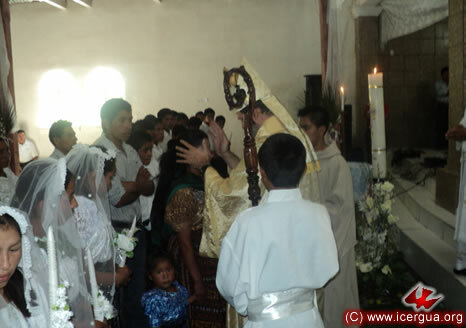 After the rite of Baptism and Chrismation, the celebration of the two marriages began. Both couples had already formed a family, and on receiving the sacrament they accepted the commitment to renew their family life on every level. 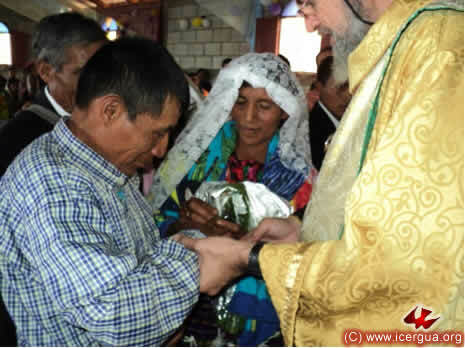 Distribution of Communion began by administering it to the eight children who had been initiated into Christ Life, then to those who were making their Solemn Communion, then to the marrying couples, and then to all the People of God. The number of participants in Communion was huge. 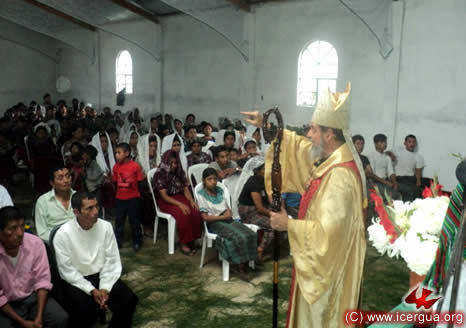 On Sunday morning, April 22, the bishop came to the Arenales Community in San Gaspar Ixchil, Huehuetenango. The principal reason for the visit was the blessing of the new church that the faithful had built through countless sacrifices. Christian Initiation was also administered to fourteen children. 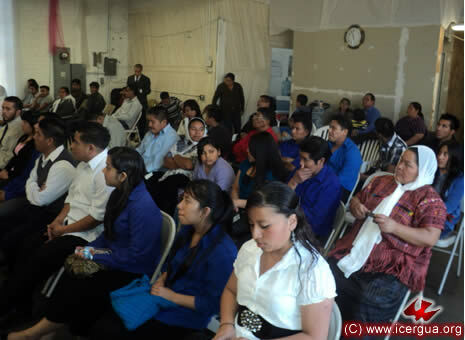 In addition two people were confirmed and given their missionary commission. 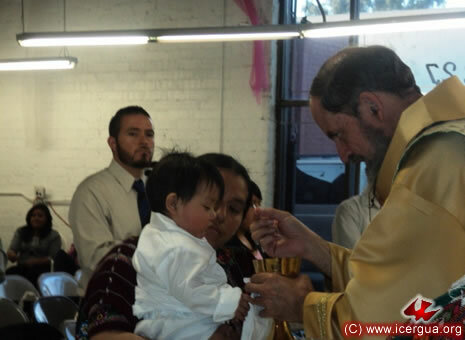 After the ritual of Baptism and Chrismation, the blessing of the community’s new church began. Right: All the worshipers praying while the bishop does the ritual prayers of blessing. 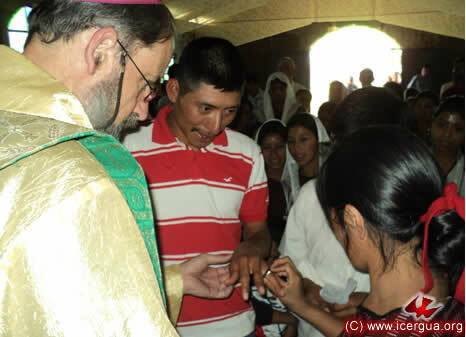 At the Communion, the children who were being initiated into Christian Life were first to receive it. 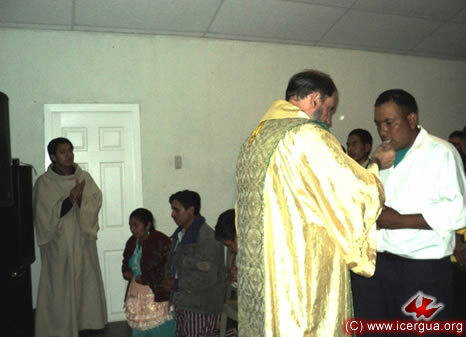 Left: Jairo receiving Communion. He is the second son of a family that recently converted and joined the Church. 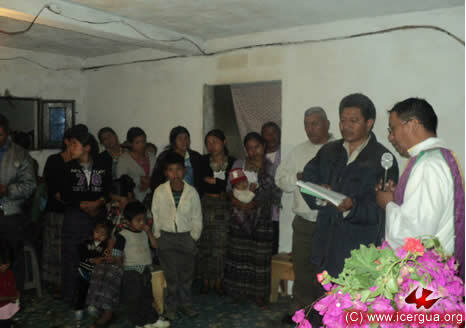 Edgar, Magdalia, and Mariela were baptized in addition to Jairo. The ceremony began with the sacrament of Reconciliation. 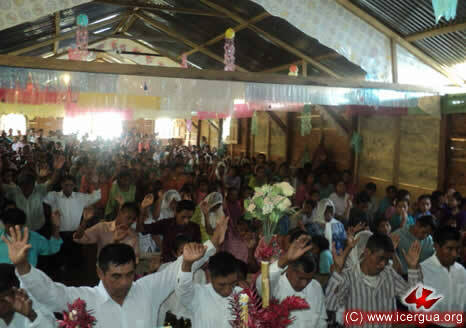 That made it possible for about two hundred worshipers to come forward to participate in Communion. 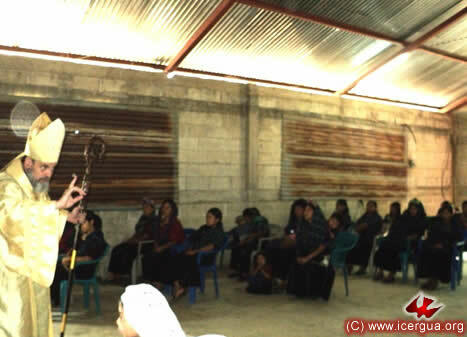 On Sunday afternoon, April 22, the bishop visited the Xolbé Community in Sololá. 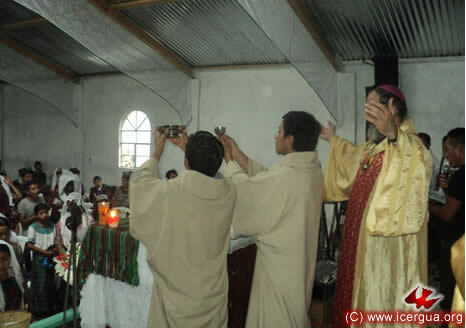 The celebration of Eucharist climaxed the customary Assembly that had begun in early afternoon. The visit began with the administration of Reconciliation. 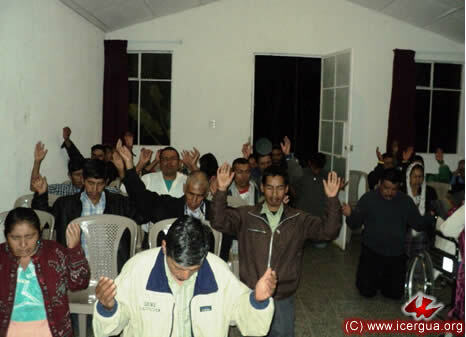 Left: The worshipers in prayer, giving thanks to the Lord for Absolution. Although it is small, the community is well organized. 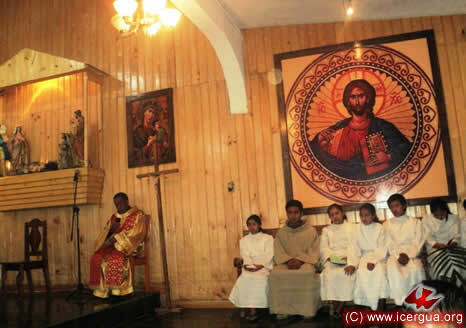 It has a music ministry, which can accompany all the singing during the Mass, and a reading ministry that likewise was well prepared to proclaim the liturgical readings. By participating in Communion, the worshipers felt that they had culminated their Assembly and were ready to witness to the Risen Lord in every aspect of their lives. 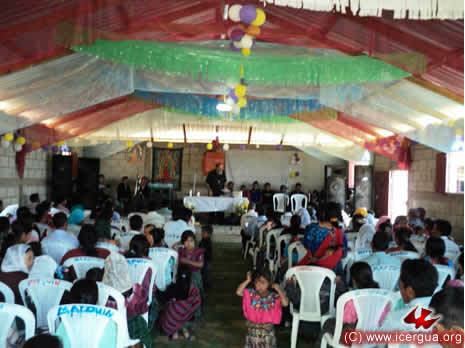 On Friday, April 27, Monsignor Eduardo came to the Tzununá Community in the municipality of Santa Cruz La Laguna, Sololá, to celebrate the Eucharist and Solemn Communion for six children, members of the community. The celebration began with administering Reconciliation. For the children who were making their Solemn Communion, it was also the first time they had come forward for Reconciliation. During the homily the bishop reminded the worshipers that tocelebrate Easter is to renew our encounter with the Risen Lord and to prepare to live and work like the apostles after Pentecost. 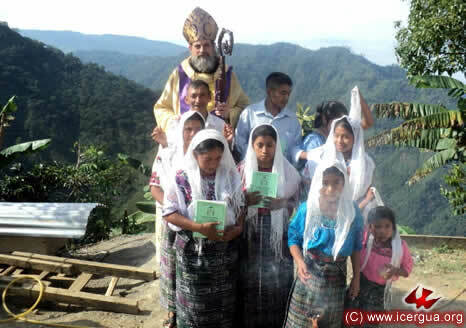 In late afternoon the bishop visited the Jaibalito Community located on the banks of Lake Atitlán. The celebration began with the administration of the sacrament of Reconciliation for all those who wanted it. The homily exhorted the worshipers to renew their missionary commitment, for the authenticity of the renewal of life in the Spirit is known by its fruits, and the missionary dimension is one of the fruits that cannot be lacking in the life of a Renewed Catholic. 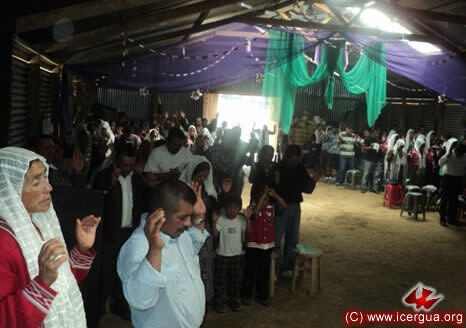 The worshipers came forward in great number to participate in the Communion with the body and blood of the Lord. 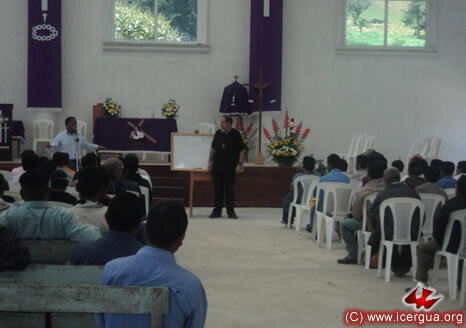 On Saturday morning, April 28, the bishop came to the Quiajolá Community in San Sebastián Huehuetenango, for the quarterly instruction to the servers and the various communities in this area. Servers from the majority of the communities were present. 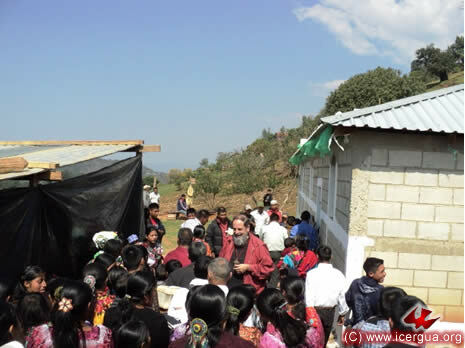 Beginning at the start of this year, the bishop has been giving instruction to the community, and a missionary has been working with the members of the community. As result, the lethargy that had characterized most of the communities in this area has been overcome. Now the faithful are showing great enthusiasm, and the communities are showing clear signs of growth. During the instruction, the bishop continued to explain the meaning and characteristics of the Church that Christ founded when he sent the Holy Spirit to the apostles on Pentecost. The faithful were very receptive to and enthusiastic about this instruction. 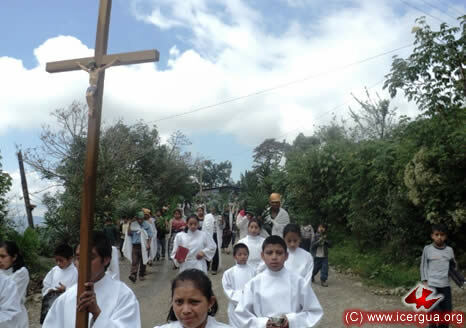 In the afternoon of April 28, Monsignor Eduardo celebrated the Eucharist with the faithful of the Quiajolá Community, which is clearly the best organized and largest in the municipality of San Sebastián Huehuetenango. 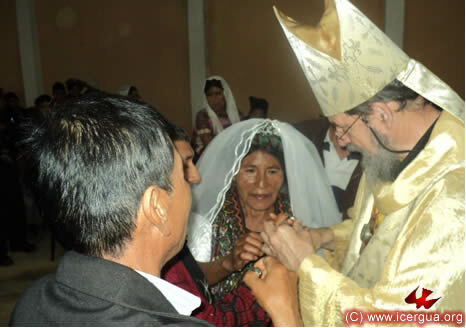 For the bishop’s visit, there were prepared the celebration of marriages, the Christian Initiation of several children and Confirmation and missionary commission for several young people. 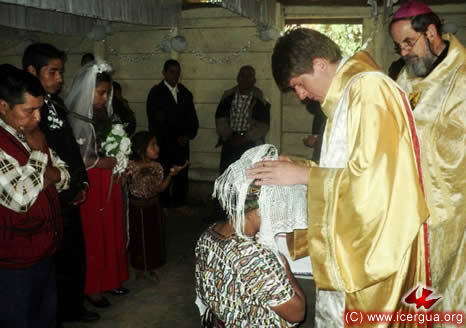 One of the marriages that was celebrated was of a recently converted couple, and the Christian Initiation of their children was also celebrated. 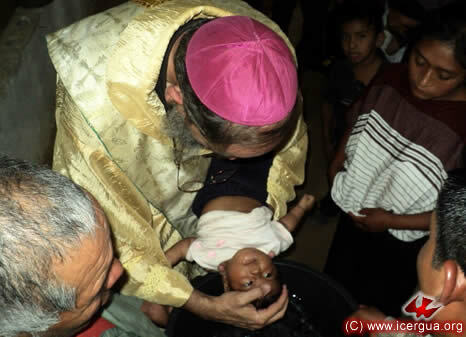 Since the time when our Church began to administer Christian Initiation to those who are baptized, great joy has been manifest among all the worshipers. Communion with the body and blood of the Lord, administered to those who are baptized and chrismated, has meant something very special in the life of the Church. Although sometimes there are minor inconveniences with respect to the form of the administration, in general the experience has been overwhelmingly positive. 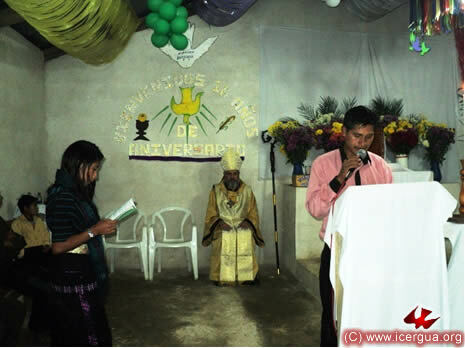 In the evening of April 28 the bishop presided at the celebration of Eucharist in the Education Center in Huehuetenango with the first- and fifth-year DETYM students. The meeting the students for the first time since this academic course began was a beautiful occasion . During the homily the bishop, in light of the readings, emphasized the importance of education for acquiring the ability to fulfill the Church’s mission appropriately. 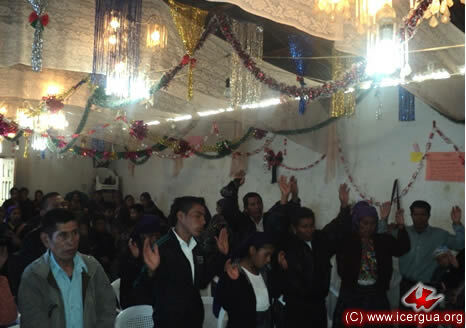 The worshipers participated actively in the entire celebration. 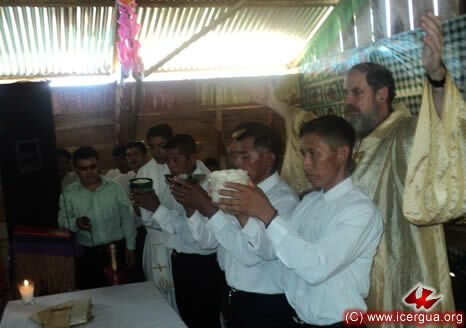 Right: Some of the communion ministers who were present offering the bread that was to be consecrated. 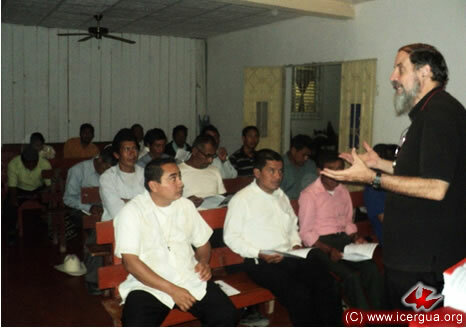 The teachers in the current cycle of DETYM are seminarians José Alfredo Hernández and José Raúl López. The two have made a great effort to provide an education that is accessible to and appropriate for all the students. 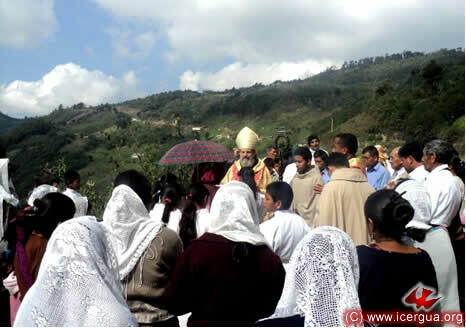 On Sunday morning, April 29, the bishop began his pastoral work in the Tziminas Community, which is located in the most mountainous part of the municipality of San Sebatián Huehuetenango. 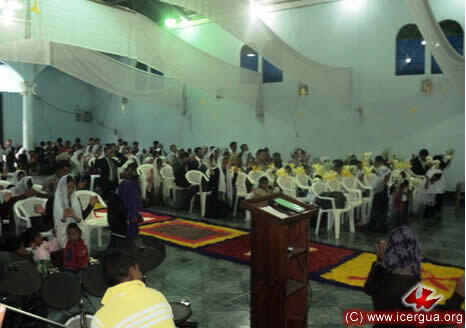 The faithful were celebrating the community’s anniversary. In anticipation of the bishop’s visit, the Christian Initiation of several babies had been prepared. 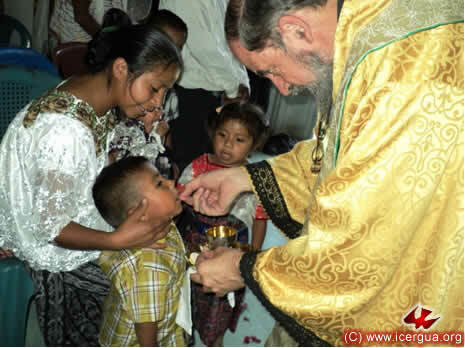 Left: The bishop administering communion to one of the children who was being initiated into Christian Life through Baptism and Chrismation. 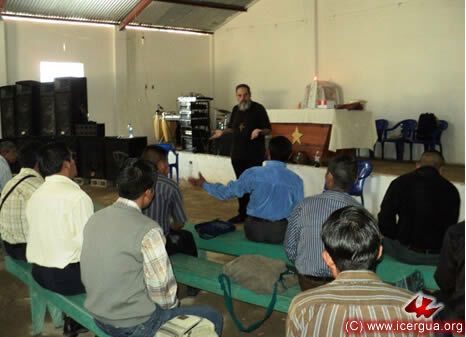 At midday, Monsignor Eduardo came to the Chejojh Community, also in San Sebastián Huehuetenango. 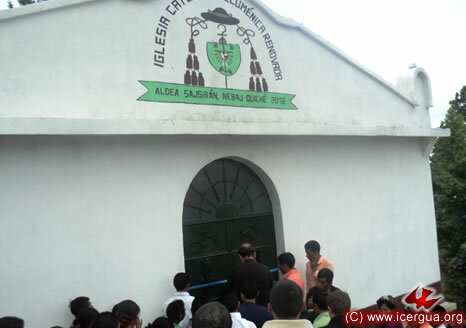 It was the bishop’s first visit to the community, which recently built the first section of its church. 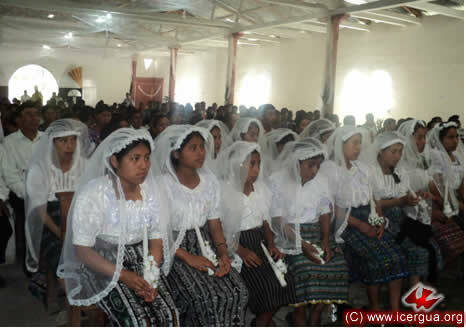 The faithful had prepared the Christian Initiation of several children, the Confirmation and mission commission of young people, the Solemn Communion of some others, and also two marriages. 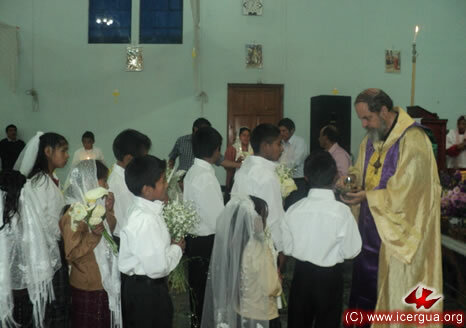 Seven children were initiated into Christian Life. 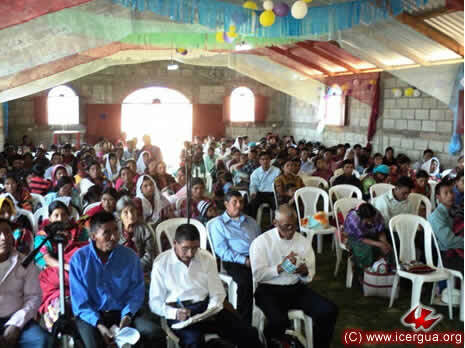 Confirmation and missionary commission was administered to nine young people. Two couples joined their lives through the sacrament of Marriage. Both had recently converted and having received the sacrament of Marriage will now be able to participate fully in the life of the Church. 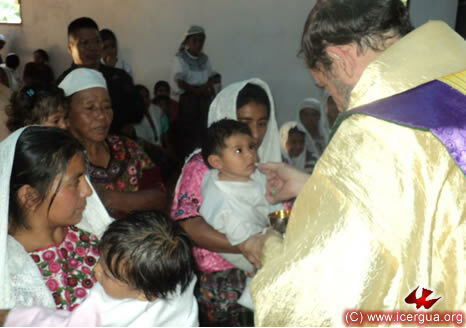 The administration of Communion culminated the Christian Initiation for the children. 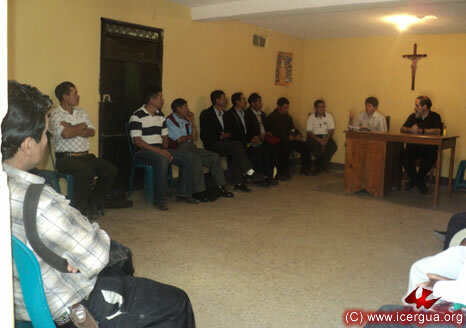 29: VISITA A LA COMUNIDAD DE SIPAL, SAN SEBASTIÁN HUEHUETENANGO. 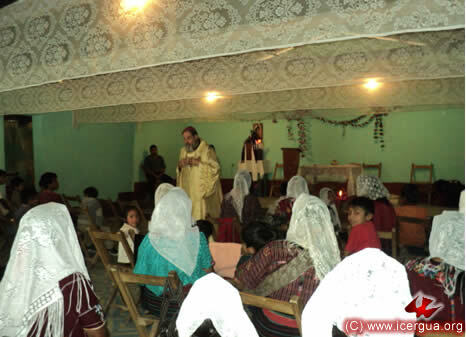 In the afternoon, Monsignor Eduardo came to the Sipal Community in San Sebastián Huehuetenango in order to celebrate the Eucharist. This community is the oldest one in the municipality, but because of some organizational problems its growth has been at a standstill. During the homily the bishop urged all the participants to start anew on the path of commitment and mission outreach.